Senators from the Plains states are trying to persuade colleagues to create a permanent disaster fund for farmers despite objections from some farm state senators, environmentalists and the White House. Proponents have found a way to include $5 billion in the Senate's version of the farm bill to reimburse growers for weather-related crop losses. While politically popular in Plains states, the issue is troubling to some environmental and farm groups that would like the money for other needs. "The real issue here is what is the government's responsibility?" said Ken Cook, head of the Environmental Working Group, an advocacy group that has opposed the aid. "You are squeezing out the opportunity to invest in other things." Cook says the money would go to drought-prone states, such as the Dakotas and Montana, that already get millions in farm subsidies. The chairman of the Senate Finance Committee, Sen. Max Baucus of Montana, wrote the disaster legislation. It was approved by his committee Oct. 4 to be part of the farm bill. 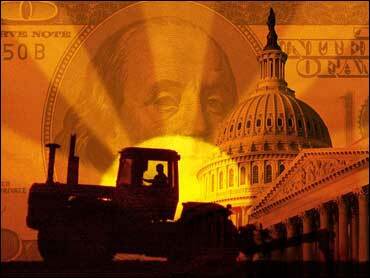 Cook's group recently released a study that reports the government spent $26 billion in emergency agricultural disaster aid between 1985 and 2005. According to the study, 66 percent of "chronic recipients" - or farmers who have received disaster aid for 11 or more years - come from five states. Texas tops that list, followed by South Dakota, North Dakota, Oklahoma and Georgia. Sen. Kent Conrad, D-N.D., likens the study to "criticizing Katrina aid because it would go to a place that floods." Conrad has spent much of his Senate career arguing for disaster aid, especially with an intense drought in the Dakotas in recent years. He says farmers need protection because their business is harsh and unpredictable. Baucus' bill would require farmers and ranchers to purchase crop insurance in order to be eligible for disaster assistance. Supporters say the proposal would help taxpayers by potentially reducing the amount of government aid needed. The legislation "protects taxpayers by encouraging farmers to take care of themselves," Baucus says. Sen. Pat Roberts, R-Kan., has said he is concerned that the program could be used as a "slush fund" for nonagriculture programs. "We should consider disaster on a merit and need basis," he said. In a statement, acting Agriculture Secretary Chuck Conner said the Bush administration would prefer to protect farmers by basing payments on when revenues are low and increasing direct payments to farmers. Sara Hopper, a farm policy expert for Environmental Defense, says the money should go instead to conservation programs that protect environmentally sensitive farmland. The money could prove to be a problem down the road. The chairman of the Senate Agriculture Committee, Sen. Tom Harkin, has never really liked the idea of a permanent disaster fund. Harkin, D-Iowa, has said he would prefer to use extra money for other priorities. But he has conceded in recent weeks that the disaster program probably would be part of the farm bill. Baucus' proposal would raise money by cracking down on companies under the "economic substance" doctrine. For a company to claim a tax deduction for a specific transaction, the transaction must yield a profit or have some other clear economic benefit separate from the tax effect. Though that idea has the support of Iowa Sen. Charles Grassley, the top Republican on the Finance Committee, most of the committee's other Republicans voted against it. But the disaster money is only one sticking point in the farm bill as senators continue to haggle over how much to cut farm subsidies and the amount of money that will be distributed for conservation programs. The Senate Agriculture Committee is expected to consider the bill this month if negotiations go well. If the disaster money survives the Senate, it could face obstacles in negotiations with the House. The chairman of the House Agriculture Committee, Rep. Collin Peterson, D-Minn., decided not to include it in his version of the bill. Though Peterson supports disaster aid, he decided there was not enough money for it. The House passed its version of the farm bill in July.